Continuation from the previous 99 parts, the whole series can be found at http://www.nikoport.com/columnstore/. In Data Warehousing one will not be shocked to find a number of tables using IDENTITY property on a column, a lot of times to create automatic incremental values for the surrogate keys. What about the Columnstore Indexes ? Should one use IDENTITY for the tables with Clustered Columnstore Indexes ? This blog post will try to respond this question from the perspective of the data loading performance. Let’s create staging table FactOnlineSales_Stage with 2 million rows from the FactOnlineSales. This staging table shall be used as a source for data loading procedures. This process took over 11 seconds with a very similar amount of time (around 10.5 seconds on average for the CPU time spent). This result is far from being good or exciting. Looking at the execution plan exposes that it is being executed single-threadedly, with no advantages of running this workload on the enterprise edition – which is truly disappointing. The reason behind this is our IDENTITY column, which in order to be generated needs to be executed single-threadedly and this invalidates the potential parallelism, even though our estimated cost is above 250. This was so bad, that even reading the data out of the Clustered Columnstore Index was limited to be a single-threaded process. In SQL Server 2016 there were some significant changes for the data loading process and in Columnstore Indexes – part 63 (“Parallel Data Insertion”) I blogged about it, showing that TABLOCK hint on the destination table might help you getting parallel data insertion (it will not work if you are loading data from a different server). You might be shocked or surprised, but hey – there are no changes in the execution plan (well, besides the overall estimated costs lowering down to 170 from 250), but the execution is still single-threaded and the differences in the execution time and CPU time are non-existent. These are not very good news for a lot of people who would expect right from the start. I wish that Microsoft would invest some time in improving IDENTITY performance. The SEQUENCE Objects were added in SQL Server 2012 but for strange reasons they are still not popular with the developers. The Sequences can substitute the IDENTITY and give you much more with possibility of the multiple columns in the same table, automated looping and restarting and so much more. 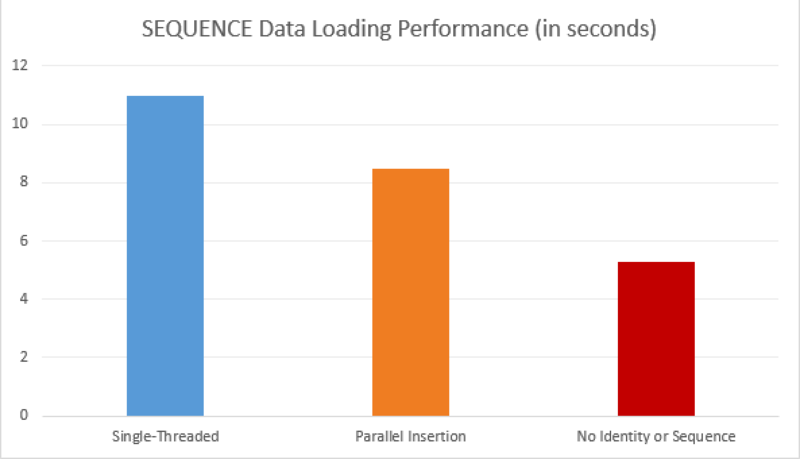 We have spent 8.5 seconds on this query and 21.5 seconds of the CPU time was spent, of course, we still did not receive the parallel reading from the staging table, but the positive impact is very visible – we get over 20% improvement in the performance! The Compute Scalar iterator is doing the following operation Scalar Operator(GetSequenceNext(dbo.S1)), basically calculating the values for the SEQUENCE next values and this is the operation that is preventing the Columnstore Index Scan iterator from going Parallel, because what one expects is that the values in the sequence shall be generated without any gaps and this part is not exactly easy with parallel processes. You see that we have almost the same execution plan as for the other serially executed queries, with the only visible difference is the absence of the Compute Scalar iterator. I have not registered any reasonably measurable performance improvement in this case. This time the execution plans takes a perfect shape of the parallel plan and the execution plan improves incredibly to the 5.3 seconds !!! This is how you truly will want to load the data into the tables with Columnstore Indexes. By allowing the load process to run completely in Parallel with 4 cores on the Test VM for those 2 million rows we were able to improve the overall execution times more than 2 times. With the help of Arvind Shyamsundar, I have discovered a wonderful article from him on the SQLCAT blog, where between many very useful ideas, the trick of using ROW_NUMBER() OVER (ORDER BY (SELECT NULL)) is described. And here is the script that shows how to deal with the tables containing identity property and that needs to be loaded really fast. Using Identities within your Columnstore Indexes tables is not a very efficient method when considering data loading strategies, moving your tables to the sequences with default values and using the parallel loading strategy with TABLOCK hint will bring you some improvement. This improvement will become bigger, proportionally to the overall time of the data insertion process. If you need to load data as fast as possible, consider moving completely away from the IDENTITY property and the Sequence object. Of course a lot of times this structural changes might not be completely possible, and this blog might shed some light on why your data loading processes are slow. I hope that in the future the performance of the IDENTITY and the SEQUENCE will be improved in the SQL Server, there are way too many solutions which structure will not be changed in the next years, but the improvements to loading process will be so much welcomed and celebrated. I just tried tests on vNext and parallel execution IS enabled for Identity table with TABLOCK, but execution time is higher than for SP1 SQL Server, where is no parallel plan. 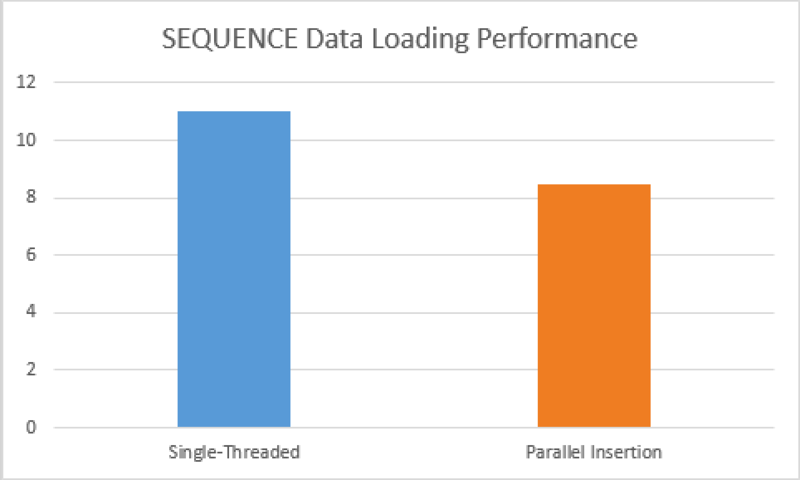 Worse news are for Sequence table – there parallel plan take over 90s, maybe this is because of over scaling VM. I tried to run all three versions of tables against this machine together (to enable majority of cores) but queries for seq and nothing run approximately 90s. will try out today to find out. I tried out on SQL Server vNext (1.4, version 14.0.405.198) and have seen no differences. I do not get any new parallelism on SQL Server vNext and the data reading for the single-threaded data processing still runs with Row Execution Mode. I believe the limitation here is exactly how IDENTITY and SEQUENCES are generated (single-threadedly and non-optimised). Can you share the execution plans that you are getting ? I tried again the same thing – and from Azure VM 4cores/14GB RAM I get same results as you. I was surprised, why I saw something different. Then came to my mind, that first time, I had machine 20cores and 140GB RAM. So I resized machine and ran query against Identity table “dbo.FactOnlineSales_Identity” with TABLOCK. I get the same result that you. Then I drop/create stage table, identity table and heureka – get parallel plan. I will send you screenshots in email. Great Read ! Could you please clarify on below points ? 1. “To create a Sequence in SQL Server you can use the SQL Server Management Studio or t-sql (and notice that I have set the Cache to 100.000 values, so it might perform a little bit better than Identity, which is cached to 50 values by default” – I didn’t know identity values are cached, Is there any way to increase default cache size for IDENTITY ? 2. Are there any side-effect of bumping up cache size to 1mn for SEQUENCE ? Where does cached values reside ? Will that affect execution plan for bulk loading as well ? Appreciate your help. Thank you. Actually the 50 is the DEFAULT cache value for the SEQUENCE and for the IDENTITY it is set to 1000. I will correct the article. 1. Not to my knowledge. 2. Cache size will affect how often Sequence persist the cache value to the disk. Potentially on big transactions it can slow them down. If you have a restart your server in the middle of transaction or instance failover shall take place, then you shall potentially loose up to this amount of numbers in the sequence. It is up to you to decide which number is actually acceptable. Thank you Niko for taking time to help. Congratulations for awesome blog series !! I have table with 40B records and 10 TB size on clustered columnstore index. I am running a query which 0 records or only 2-3 from this large table . 1) If I run select count(*) then it returns quickly less then minute. 2)If I run select * from then it takes 15-20 minutes. If sql can count 0 or 2-3 records in seconds so why select * takes minutes? Plan also different for both query to search data. you will need to provide the actual execution plans to understand your problem, plus the relevant STATISTICS IO & TIME. How to provide plan ? does it takes same time? If you wish, upload the execution plans to some place where I can take a look at them, for example to https://answers.sqlperformance.com. Please include the information on the SQL Server with respective patches (CUs & SPs) and the compatibility level set for your database. I do not need to try out something that works perfectly on my system. Most probably you have different execution plans for the queries with parameter sniffing or outdated statistics. You should also understand that I am not providing any support, nor am I working for Microsoft.